We are remarkable entity, occupied in trading the best quality Safety Latex Gloves at most genuine rates. - For protection of workers hand from hazardous chemicals, sharp tools, etc. - Poly Cotton or Polyester Fiber enables soft & convenient to wear, decreases the tiredness of users hands for longer working hours. Good Abrasion resistance. With a far sighted vision, a keen perception of the market trends, we are actively engaged in offering quality assured Woolen Hand Gloves. To meet different requisites of our valued clients, we are betrothed in providing an excellent quality Unsupported Latex Gloves. 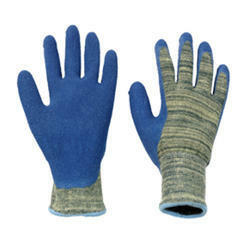 - Unsupported latex gloves with inner cotton flock lining are designed for high dexterity. We are a reputed name in the industry, devoted towards offering the best quality array of Latex Hand Gloves.